Hi everyone, happy new year. This is not much of a posting but it breaks the duck for Jaunary 2013. … you are criticised by Vatican about Human rights. I momentarily thought that the news on BBC website was very interesting, and we might have a chance for real change in UK… (change you can believe in). 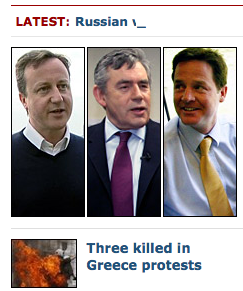 But then I notice that the pictures of the 3 leaders are associated with a different story. I was a bit shocked that people realised that we can easily come to same economic condition as Greece. Of course UK debt is completely different, Greek people are just lazy, and Goldman Sachs and Politicians have nothing to do with the situation. 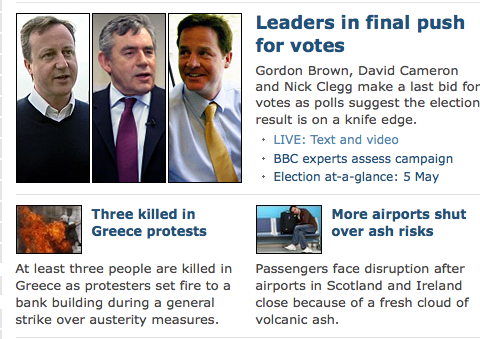 It’s really a shame that 3 people die in the greek protests. I hope they didn’t die in vain. A quick look at http://www.spacewar.com/ will show the surprising news that North Korea aren’t the only ones testing missiles! With so much news about North Korea launching a few rockets, you might be shocked to know that USA, Britain, France, Israel, India, Pakistan, Russia, China are all testing missiles regularly! March 29, 2009 Indian tests cruise missile: official (developed with Russia). 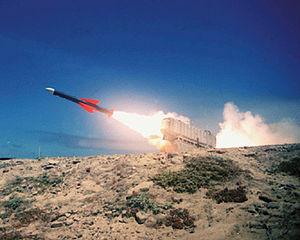 May 07, 2009 Raytheon Develops Anti-Surface Warfare Capability For Tomahawk Block IV Missile More than 1900 Tomahawk missiles launched in combat since 1991. The explosive, while larger than the first test in October 2006, was still far short of the expected yield of a crude Hiroshima-type bomb, according to Jeffrey Park, director of the Yale Institute for Biospheric Studies. “More than likely this means North Korea tried and failed to get a simple plutonium bomb to detonate correctly,” Park wrote in an article on the website of the Bulletin of the Atomic Scientists.